There are a slightly lower number of seats in the 3200-series cars when compared to other High-Performance Family cars, sacrificed for more standing space. Four of the transverse seats -- in the center of the car between the sets of side doors, two on each side -- are single seats rather than the standard double seats, as are two seats at the 'B' (non-cab) end of the car. The extra floor space provides more room for standees during rush hour. Like other modern cars, some seats near the doors face toward the aisle to accommodate equipment underneath. Altogether, of the 39 seats in the car, 15 seats face inward and 24 face forward or backward. The new cars were equipped with both air conditioning and openable hopper windows in case the A/C was inoperative. The 2200-series cars had been retrofit with hopper windows in their mid-life rehab around 1990; the 2600-series cars received them in their mid-life rehab in the late 1990s and early 2000s. The computer components installed in the cars allow for some significant advancements in the cars' troubleshooting. The cars' microprocessor cam control group allows for the use of the General Electric-supplied Portable Test Unit (PTU) diagnostic system. The PTU allows a repairman to hook a laptop to a car, run a diagnostic, and quickly get a highly-detailed record of conditions and component status. Cars 3441-3456, identical in all other ways to cars 3201-3440, were delivered with pantographs for the "Skokie Swift" Yellow Line. Later, the pantographs on cars 3451-56 were removed so the cars could be assigned to other lines that needed additional equipment; cars 3441-3450 continued to be pantograph-equipped for use on the Yellow Line until late 2004. In September of that year, the Yellow Line was converted to third rail traction power and the pantographs became superfluous. The pans began to be removed from these 10 cars in late 2004 and the last came off in early 2005. However, all of the former pan-equipped cars (units 3441-56) retained the roof boards onto which the pantographs had been mounted. Before the order was completed, an additional car was added to the order -- bringing the total to 257 cars -- which was paired with 2600-series car 3032, whose mate was damaged in an accident. Car 3032 was renumbered 3458 on February 25, 1994, and paired with car 3457, created the first "mis-mate" that consisted of two cars of different series. The procurement of the 3200s allowed the retirement of the last of the 6000-series and nearly all the 2000-series cars. Cars 3201-3456 were originally assigned to the Brown, Yellow, and Orange lines, and generally stayed on those routes for the first 20+ years of their service lives. 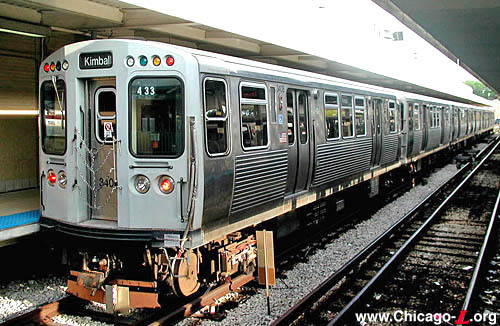 The CTA's Capital Improvement Plan included FY 2003-2007 funding for a light "C" overhaul (replacement of limited number of components) of the 3200-series cars and the beginning mid-life rehabilitation of the 3200s. Completion of the "C" light overhaul came in December 2004. In mid-2004, the CTA modified a two-car 3200-series unit with a longitudinal seating arrangement on a test basis to test how additional maximum capacity could be attained with new seating configurations within existing car dimensions. Cars 3407-3408 were given a new interior seating plan with a longitudinal arrangement. To make up for the handgrips that were on the tops of the removed transverse seats, horizontal metal grip bars were installed overhead along each side of the aisle. In addition, vinyl straps were also installed in some places along the overhead stanchion and vertical metal poles were also located between every two seats. 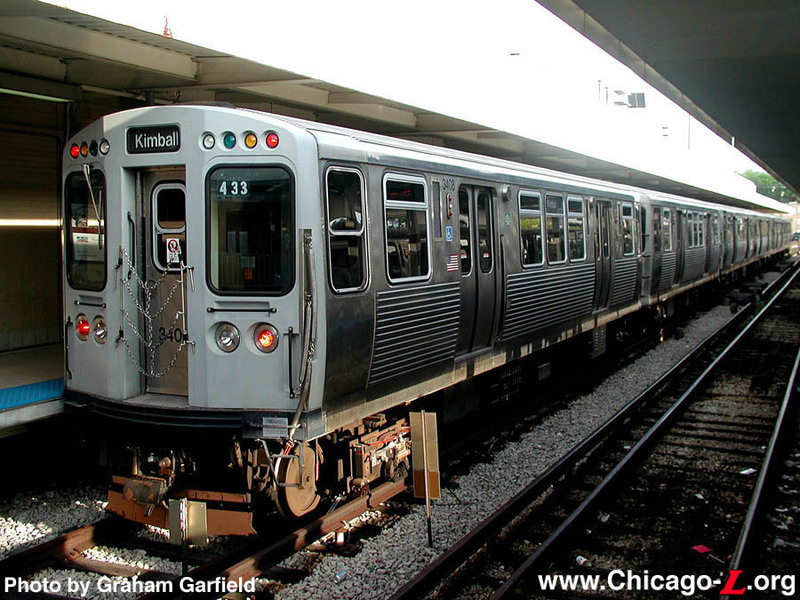 The CTA released the cars on Monday, May 17, 2004, first assigning them to the Brown Line before rotating them to a different line after about a week's time and surveying riders to ascertain their feelings, experiences, and preferences. The cars completed their test service on July 3, 2004 and were subsequently returned to their as-built seating configuration. To learn more about these cars, click on the gallery link below. Rolling stock assigned to Skokie Swift service had traditionally been equipped with wheel scrubbers to enhance contact between the train's running gear and the track. Positive contact is essential to the operation of ATC cab signals and automatic grade crossing warning devices. Wheel scrubbers were applied to the original Skokie Swift single cars in 1964 primarily due to their light weight. With the advent of longer trains and the heavier 3200-series cars in Yellow Line Skokie Swift service, the CTA began running tests to determine the future need for wheel scrubbers. To accomplish this, effective Monday, September 12, 2005 the first train to depart Howard every Monday morning was car 3457-58 or any Purple or Red line unit which are non-wheel scrubber equipped cars. The Maintenance Manager and Rail Supervisor then monitored the cars' operation and reported any ATC or grade crossing malfunctions to see if there is a noticeable problem with operations. As of September 2005, all ten Yellow Line 3200-series -- cars 3441-3450 -- were equipped with wheel scrubbers. The test was concluded in late 2005 and a decision was made to remove the wheel scrubbers shortly after. In Fall 2008, the CTA announced a pilot program to test three pairs of reduced-seating rail cars on the Brown Line in an effort to increase capacity. The reduced-seat cars were phased into service the afternoon of September 12, 2008, running only during peak periods on the Brown Line. The changes were part of an effort by the CTA to accommodate an increase in ridership. Preliminary CTA numbers for August 2008 showed a ridership increase of 9.5 percent compared to August 2007. In hard numbers, that meant that 808,000 more train rides were taken in August 2008 compared to August 2007. For the year 2008, ridership was up 5.3 percent compared to 2007 as of the time of the cars' launch. The high-capacity cars were dubbed MAX Cars, and six 3200-series cars were chosen for the pilot. The cars chosen were cars 3321-22, 3323-24, and 3325-26. The goal was to increase the floor space to allow more standees onto the car, thus increasing their carrying capacity. Because new railcars have a long lead time, this was seen as a fast, economical way to cope with increasing demand with the existing fleet of railcars. Twelve of the cars' 39 seats were removed in one of car in each pair, and 14 were removed in the other car to provide increased standing room. For every seat removed, CTA estimated that at least two riders can be accommodated. Additional stanchions and hand-hold straps were added to these cars for the safety and convenience of standing customers. The six pilot railcars with reduced seats were clearly identified for riders before they boarded the train with large "MAX - High Capacity Car" decals located on both sides of the train's doors indicating they are reduced seating cars. The decals used white lettering on a dark yellow/gold background. Although the CTA originally considered removing all the seats from designated cars, engineering tests determined that doing so could pose potential operational and safety issues. The specifications for the cars' original design designate a load of 22,500 pounds. CTA personnel tested the weight limits of the rail cars and determined that removing all the seats for standing customers would result in a weight increase that exceeds the specified design weight limits. While a railcar with all seats removed would still operate, stress would build up on the suspension and undercarriage and would result in reduction of the built in safety factors causing damage to the rail car body structure, suspension or undercarriage. Using a formula of estimated customer weight of 175 pounds per person, design capacity and floor spacing, personnel were able to determine how many seats could be safely removed without adversely affecting the suspension system. The cars with reduced seating are better able to manage the extra weight distribution. In addition, by leaving seats in the cars they are better able to accommodate riders who require priority seating such as seniors and expectant mothers. CTA had developed plans for converting more 3200-series cars to MAX Cars, as well as a number of 2600-series cars assigned to the Red and Blue lines (the first and second highest ridership lines), if the pilot was successful. However, public reaction was negative -- although the cars did, in theory, reduce wait times at rush due passengers not being able to board packed trains by adding capacity, the perception of having less chance of getting a seat due to there being fewer of them was seen as a severe negative by many riders. The pilot ended, and no additional cars were converted. However, the six MAX Cars were not converted back and remain in their reduced-seating high-capacity form. The decals on their exteriors marking them as MAX Cars were removed circa 2010. The CTA plans a mid-life overhaul of the 3200-series railcars to extend the life of the railcars and improve their performance, efficiency and reliability by replacing or rebuilding many of the cars' major components. The overhaul of the 3200s will replace many of the cars' major operating systems, including installation of new air conditioning systems and the rebuilding of the propulsion system (including motors and batteries), passenger door motors and the wheel and axle assemblies. In addition, wiring will be replaced, and springs and control equipment upgraded. Personnel at the CTA's Skokie Heavy Maintenance Facility will perform the overhaul work over the course of two-years, similar to the in-house mid-life the 2400-series cars received in the 1990s. The total estimated cost of the overhaul is $166 million. Work to rebuild all 256 3200-series railcars is not expected to begin until 2015, but in 2013 the CTA started the process of procuring parts and operating systems that have long-lead times and require successful testing of pre-production samples. On August 14, 2013, the Chicago Transit Board approved the award of two contracts that are part of the mid-life overhaul of the cars. The Board approved a $8.2 million contract to Ellcon National Inc. for the purchase of new auxiliary power systems that will be more efficient and reliable for the remaining years of service of the 3200-series cars. A second contract valued at $4.1 million was awarded to Axion Technologies for the purchase of color light-emitting diode (LED) signs, which will replace the roller curtain destination signs on the sides and ends of each railcar. The LED destination signs will make the 3200s' signs consistent with those on the newer 5000-series cars. As part of the overhaul, the cab signal system on the 3200-series cars were modified with two key modifications. The first modification was the ability for the Allowable Speed of the Automatic Train Control (ATC) system to be set to, and enforce, a six (6) miles per hour speed limit. Prior to this modification, the lowest Allowable Speed setting was 15 mph. The other modification was the "Coast Contactor" function. The Coast Contactor function causes the propulsion system to go from propulsion to coast when the Allowable Speed is reached. This occurs automatically and requires no action to be taken by the Operator. If the actual train speed drops below the Allowable Speed, the propulsion system will re-engage and bring the train back up to the Allowable Speed. The Coast Contactor function is designed to reduce the possibility that the train will accelerate beyond the allowable speed, reducing the amount of manipulation of the master controller required between power and braking positions while operating. The first 3200-series rail cars modified were cars 3341-3342, in March 2017. They were used to demonstrate and instruct on this modification to the Cab Signal System. The program resulted in another 3200-series mismate, repairing and pairing two 3200-series cars whose mates had been damaged in accidents. Mismate cars 3351-3448 reentered service after the program, car 3448 retaining its roof boards but car 3351 still without, resulting in an obvious visual difference between the cars in the pair. The mid-life overhaul of the 3200-series railcars was completed in autumn 2018. Annual ridership on the O’Hare branch increased by 5.4 million rides between 2006 and 2016, making it the CTA's second-busiest rail branch. The increased ridership is due in part to increased redevelopment along the branch, including new residential high-rises along Milwaukee Avenue.10 In addition, the Blue Line had been entirely equipped with 2600-series cars, built between 1981 and 1987, since 2013. With the 2600s aging past 30 years and approaching their intended design life, the cars were experiencing an increasing rate of door and mechanical problems per mile, resulting in service delays. These two factors combined resulted in passengers during rush hour sometimes having to wait for three or more trains at some stops before they can board. As a result, 100 3200-series cars were transferred to the Blue Line, making up just a quarter of the line's assigned cars. Slightly newer than the 2600s and just having gone through midlife overhaul, the intent was increase fleet reliability.11 CTA also added two additional trips to the Blue Line during the morning rush, between 8 and 8:30am, and one extra trip during the evening rush, between 5 and 5:30pm, using 5000-series cars from 54th Yard. 1. "CTA to Expand Surveillance Cameras on Rail Cars". CTA Press Release, February 11, 2013. 2. Hilkevitch, Jon. "CTA adding cameras to older rail cars", Chicago Tribune, February 9, 2013. 3. Swartz, Tracy. "CTA testing electronic signs on Orange, Brown Line cars" Red Eye. May 13, 2014. 5. "CTA Moves Ahead on Plan to Rebuild Rail Cars on Brown, Orange Lines." CTA Press Release, September 10, 2014. 6. Hilkevitch, Jon. "CTA to overhaul 257 rail cars on Orange, Brown lines", Chicago Tribune, February 11, 2015. 7. Roberts, Bob. "CTA To Rehab 'L' Cars Used On Orange, Brown Lines." CBS Chicago. September 10, 2014. 8. Hilkevitch, Jon. "Yellow Line closure creates rail car repair headache for CTA." Chicago Tribune, June 22, 2015. 9. Wisniewski, Mary. "Crowded CTA Blue Line gets newer-style cars, more rush-hour trains." Chicago Tribune, September 26, 2018. 11. Bloom, Mina. "Loving Your Commute This Week? The Blue Line Got Some Shiny New Cars -- And Added Rush Hour Trips." Block Club Chicago, September 27, 2018.